Mayor Flaviano D. Balgos Jr.
Bambang is a first class municipality in the province of Nueva Vizcaya, Philippines. According to the 2015 census, it had a population of 53,433 people. The municipality is known for its salt springs at the Salinas Natural Monument. Bambang has its beginning in the early period of Spanish colonization. The name "Bambang" is an Isinay word meaning "to dig". The first mission that dared to penetrate the dangerous wilderness and insect-infested jungles of what is southern Nueva Vizcaya today was by the Dominican Order in 1607. However, it was only two years later (1609) when a Dominican missionary come from Pangasinan. Father Tomas Gutierez arrived to establish the first missionary settlement. This settlement was subsequently called Ytuy which today actually comprises the towns of Aritao, Dupax, Bambang and a part of the Igorot tribal lands to the west (now Kayapa). Originally these places were inhabited by the Igorot and Panuypuyes (Aritao), the Ilongots (Dupax and Bambang) and the lgorot in the area west from the present native population of Dupax, Aritao, and Bambang came about by the inter-marriages of the tribes mentioned above. In 2012, Bambang became open to big dealers and businessmen as part of its progress. Now the town has its own newly opened fast food chains and other marketing establishments. 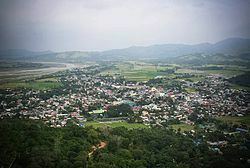 As per National Statistics Office of Philippines (NSO), Nueva Vizcaya province is part of Region-II (Cagayan Valley), Province Code for Nueva Vizcaya is 50, Municipality Code for Bambang Municipality within Nueva Vizcaya province is 4. Province of Nueva Vizcaya is administered or governed by a Governor. Bambang Municipality is administered or governed by a Mayor. Each Barangay is administered or governed by a Punong Barangay (Barangay Captain in English). Bambang is politically subdivided into 25 barangays. Among the most popular form of travel in and around Bambang is by jeepney. Jeepnies are used to bring produce in from neighboring municipalities, and for public transportation for residents and travelers. For shorter distances, tricycles are another great form of public transportation. Bambang is less than a day away from the beautiful Banaue Rice Terraces and hour away from shopping in the urban Solano. Pangayjaya is the festival name of the town which celebrated in late May to April yearly. Part of it is the annual Miss Pangayjaya (Bambang) and the counterpart Mister Bambang started in 2016. Along it's patron, Saint Catherine of Siena.